Sanitaire EON QuietPro Commercial Vacuum. The QuietPro is engineered with professional grade components for the demands of commercial cleaning. Sanitaire is a well know brand of commercial vacuums, used for many decades by cleaning crews around the country. This model is specifically made for Quiet Operation at only 68 DBA. For durability and long life, the QuietPro S5000A has a commercial grade motor, and telescopic electric stainless steel wand. The vacuum is equipped with a washable HEPA filter to keep the air clean while vacuuming, and removes 99.97% of airborne pollutants down to 0.3 microns in size. One valued feature for a commercial vacuum is Sanitaire’s easy tool-free servicing of the brushroll, and easy access to other parts. The 40 foot power cord assures that you won’t have to switch outlets as often. A Bag Full/Clog indicator alerts you to either change the bag or clear the clog. A Brushroll check light alerts you to inspect the brushroll. 4 manual height adjustments for a variety of flooring and carpets. Bag dust capacity 4.1 quarts. Sanitaire Vacuum Cord Length: 40 feet. Vacuum Warranty: 2 year parts & labor. Smart-Review Commentary: The Sanitaire Commercial QuietPro S5000A is one of Sanitaire’s quietest vacuums. To keep the air clean, this vacuum is also equipped with HEPA filtration to remove tiny dust particles and allergens from the air. The longer 40 foot cord is ideal for a commercial vacuum, letting you vacuum longer before finding another electrical outlet. This vacuum is easy to use, with 4 height adjustments, 12-inch cleaning path, and easy to maintain as most of the parts have easy access. The pigtail power cord makes replacement easy. The Sanitaire QuietPro vacuum was Certified Gold by the Carpet & Rug Institute (CRI). A bag full, clog, and brushroll indicator will warn you of action to be taken. A thermal cut off protects the motor in case of overheating. Sanitaire has a long reputation for quality commercial vacuums. This well rated premium commercial upright is a Smart-Review top pick. Description: The Sanitaire QuietPro S5000A is one of the quietest commercial upright vacuum cleaners. The vacuum has an extra long 40 foot cord, a clog & bag full indicator, and rubber wheels. This is one of the few Sanitaire vacuums with a HEPA filter. The brushroll can be serviced easily with no tools needed. 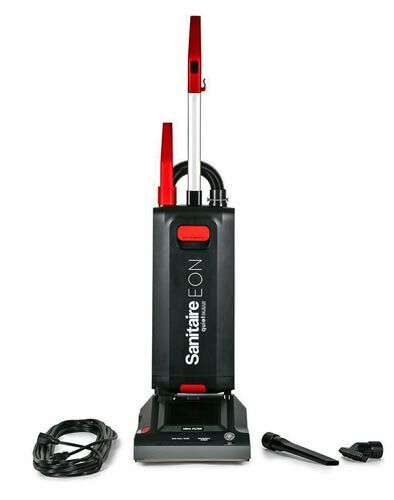 Sanitaire has a long tradition in making quality commercial vacuums. The Sanitaire QuietPro S5000A is a SmartReview.com Top Pick in commercial vacuums.